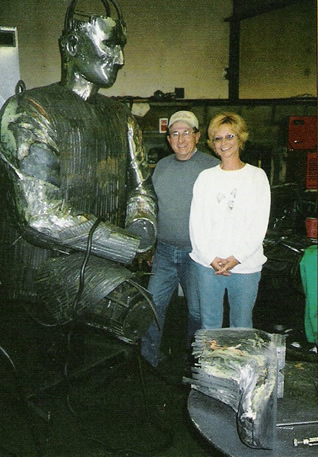 Tom Neary combines his skill as a master welder with an artist's sensitivity to create metal sculptors unduplicated by others. He grew up on a North Dakota ranch, and at an early age acquired some welding equipment and taught himself how to use it. Tom utilizes his knowledge of the materials and his experience and expertise with tools and equipment to create metal sculptures that are a blend of realism and impressionism. His work can be found in private, public and corporate collections around the world. Bill Reynolds, a graphic and fine artist from Bismarck, ND who does presentation drawings for Tom said: "Tom doesn't have to rely on sketches. He can build anything in his head. He has the best three-dimensional visualization of anyone I've ever met."